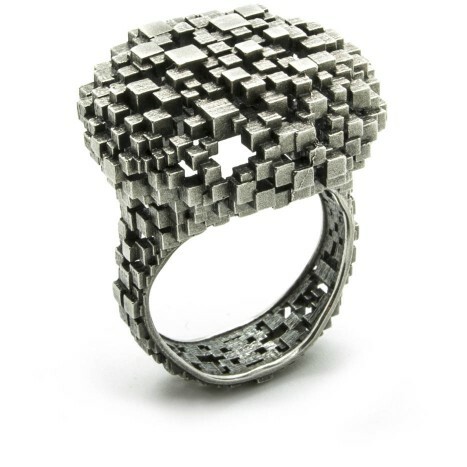 Jo Hayes Ward exquisite Structural ring is akin to viewing the metropolis from high above, dense and compact city blocks that never ceases to awe and amaze. Even as a miniature sculpture I marvel at the simplicity of the piece yet it still portrays a high level of intricacy and depth, examining the complex patterns and textures that hints at geometric, mathematical and biological influences. The surface of the ring emits trickery of lights that captures the illusion of movement and undulation. What's fascinating is the continuity of the blocks around the ring in its entirety, symbolising the rapid advancement of modernity and development of the world.